For some (like myself), it’s a small moment of drinking glorious enough to call to mind Alex DeLarge going into ecstasy over Beethoven’s Fifth: Hot water, a cool can slick with condensation, a moment of solitude, maybe some music playing … even in Chicago, mid-winter, a shower beer feels like a small tropical escape. That easily accessible moment of bliss has made shower beers a cult phenomenon, and it’s one that breweries are quickly catching on to, with the concept lurking into beer titles from Champion Brewing Co.’s Great American Beer Festival award-winning Shower Beer to Yonkers Brewing Co.’s Shower Time Pale Ale. And don’t forget about Kent Falls Lime Zest Gose—formerly titled Shower Beer, but renamed due to Champion’s Shower Beer trademark (the name “Dusche Beer,” German for shower, was considered)—and many others who riff on the concept. 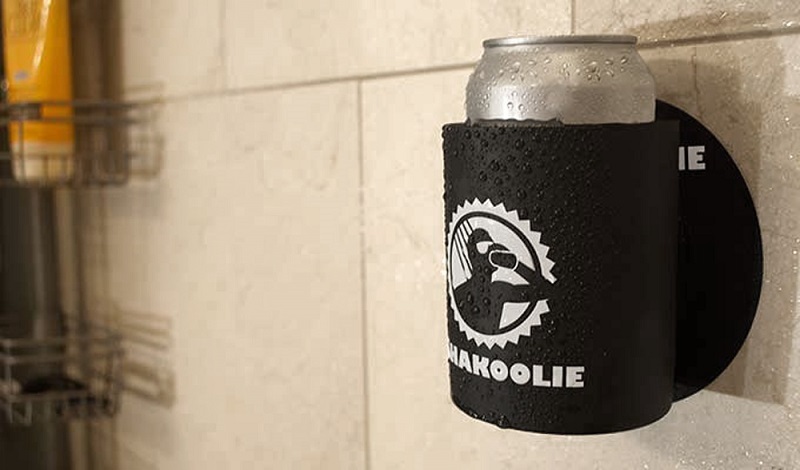 There’s even a line of shower beer drinking accessories, including the Shakoolie, tub mugs, and shower beer caddies. Not to mention the stylized and bizarre 6-ounce Shower Beer from Swedish brewery PangPang, dubbed such despite the fact that it’s 10% and served in a glass bottle (Editorial note: We do not recommend taking glass into the shower). The phenomenon, however, seems to fall on people in one of two ways. For some, shower beers are a fascination and consistent presence; for others, they’re a non-entity. External of the internet, it seems that people learn about the concept through friends and family, like a sort of folk knowledge passed from person to person. Some of the folks who make “shower beers” have actually been left outside of that loop. At Chicago’s Whiner Beer Co.—whose Le Tub wild saison label even features a cartoon of a man in a tub (pure coincidence)—neither Ria Neri nor Brian Taylor, Whiner’s co-founders, had really heard of shower beers before the brewery opened and began canning Le Tub, one of its core offerings, this year. The beer provoked a bubble of reactions from consumers over social media, as part of the cultish shower beer presence that pervades online sites from Twitter to Reddit (the latter of which has its own showerbeer community). “One girl had candles everywhere,” Taylor says. 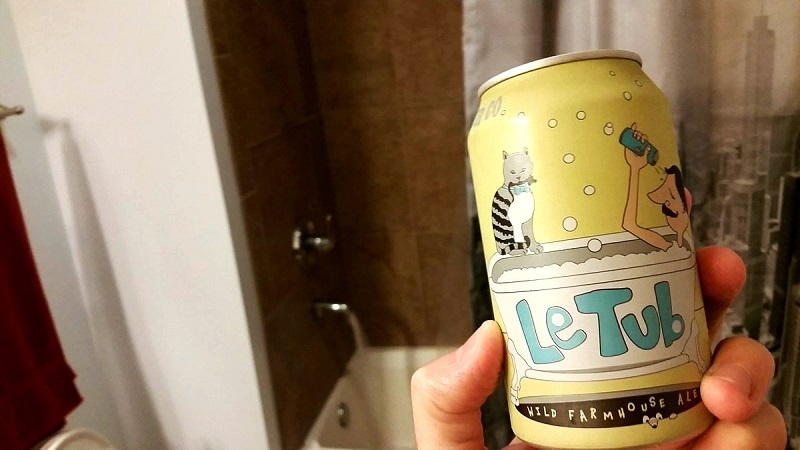 Le Tub’s name, like its label, also happens to be a coincidence. According to Neri and Taylor, Whiner strives to make approachable French-inspired beers in an aesthetic that is funny but serious—“the high-brow-low-brow type thing,” says Neri. Le Tub seemed like a natural fit for the brewery’s wild saison because, as Taylor puts it, “everything but the kitchen sink” (i.e. the tub) goes into making Le Tub an approachable saison—from kettle-souring with a house Lactobacillus culture to blending and barrel-aging both soured and non-soured saisons. Despite its intricate construction, Le Tub’s approachability is part of what makes it (to my mind) so ideal for the shower. It’s crushable like an American adjunct lager with its cracker-like crispness, but, at the same time, goes beyond the pale (or pilsner)—baring subtle stone fruit tartness, acidity, breadiness, and funk to make it a distinctive but adept shower brew (Highly recommended: drinking Le Tub to a soundtrack of Edith Piaf while in the shower—nails the “high brow-low brow” thing). In my time as a shower beer enthusiast I’ve experimented with the gamut of styles, from stouts to barley wines and double IPAs. I agree with Smith’s assessment that a shower beer—for the most part—is something generally crushable and along the lines of a “lawn mower” beer. Pilsners, lagers, golden ales and some IPAs all tend to do splendidly (though more citrus-forward IPAs are preferable). Because of the dangers of glass, cans are also ideal. I was surprised, then, to find an Imperial Shower Beer from Lagunitas at this year’s Festival of Barrel-Aged Beers in Chicago. The beer was made by aging the brewery’s Cappuccino Stout in a Willett bourbon barrel for 10 months with the additions of maple, cinnamon and vanilla. The beer was only available on draft for FoBAB, but the name made me instantly imagine sampling it in the shower, a place I was most certainly glad not to be in when I tried it. It was thick, not too boozy, and presented clear notes of chocolate, maple and cinnamon in a forwardly sweet profile. I’d enjoy a small pour for dessert outside in the snow next to a bonfire. In a shower, it’d be the equivalent of consuming a molten fudge cake on a Tahitian beach. Perhaps some would enjoy an imperial shower beer in their brief moment of escape—after all, shower beers are a transcendent moment in time personal to the participant. Me, I find I prefer to keep things nice and light on my own little tropical getaways. Bo McMillan is a writer based in Chicago. He consumes at least one shower beer weekly. Crisp like the crackery snap of its malt, the texture of this beer is ineffable, erupting into a soft and almost silky cloud of carbonation immediately upon contact with the tongue. It’s a sensation that disappears far too easily—this beer (like its can advertises) is immensely crushable. Dry to the bone and without even the subtle sweetness that can creep into some lagers, the beer’s 100 percent Saaz hop profile is all grass up front, with passing hints of flowers and orange peel that wind to a pleasingly emergent end note of spice. Impressive stuff, Hunter. Sounds like Champion Beer is quite the success.